We understand the unique nature of Life Science businesses. Drug developers,CROs,CMOs and contract research service providers work together to drive forward the discovery and development of new therapeutic products. 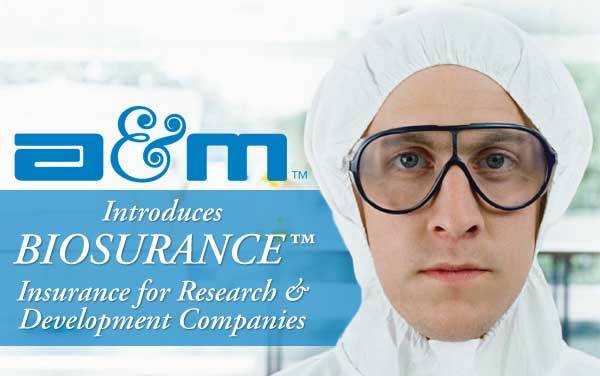 BioSurance™ R&D* is an innovative insurance product that allows companies in the R&D chain to cover their unique risk exposures in the context of their business and funding models. • Over 90% of policies issued within 24 hours of binding if we have all of the information we need. All this at very competitive prices. To obtain a quote all we need is the completed BioSurance™ R&D Application Form, which you can download here in PDF format. To review or download a PDF of the policy click here. Go to www.andersonmurison.com or call me at (800) 234-6977 ext. 220 to find out more!